In this journey for kindergarteners and first graders, Girl Scout Daisies join their flower friends for an exciting road trip in a flower-powered car. As they travel the country living the values of the Girl Scout Law, girls and their flower friends enjoy what's local and learn why that's important. They experience what is great about what grows near them, and they learn how their own special skills make the world a better place. Imported. Girl Scout Daisies join their flower friends for a cross-country road trip in their special flower-powered car! As they travel the country living the values of the Girl Scout Law, the flowers explore the natural world around them, learning what's local and why that's important. Along the way, the flower friends (and the girls!) sample the sights, and the wisdom of women working to protect Planet Earth. Daisies earn their Blue Bucket, Firefly, and Clover (uses resources wisely!) awards as they experience what's great about their own region and learn to use their own special skills to help people and Planet Earth. This journey presents Daisies the opportunity to earn three awards. Girls consider their feelings and skills and then take into account the feelings and skills of those around them. The girls then move on to engage their larger community and then they move out into their community to "do." 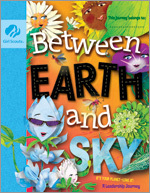 Although there's no set way to present it, you might spark the excitement of this award series by presenting the Between Earth and Sky background patch to all the Daisies at their first session. Or choose a way that works for the group. Girls take part in role-playing activities that encourage them to resolve conflicts, negotiate, and be considerate to others. Steps to the award are built into the suggested activities in the Sample Sessions. Educate and inspire others in their community to join with them to protect the local treasure, too.